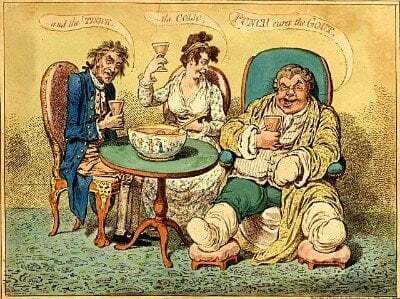 Is Gout A Social Disease? At this time of year, I’m often in reflective mood. Looking back at the past year’s achievements. Looking forward to next year’s challenges. Today, I am mindful of the social aspects of gout. Who amongst us has avoided the laughter and derision when we share our goutful state within our social circle? We have even had gout forum contributors complain of their doctor’s diagnosis accompanied by gleeful laughter. It’s not funny! Gout hurts. But it also hurts and saddens me to see the attitudes to this most painful of health conditions. People perceive gout as some form of amusing self-harming. So we hang our heads in shame, complaining of age and arthritis, scared to mention the G word. But this is wrong. We have to take charge, and tell the world about gout as a genetic metabolic problem. We need to play down the food aspects. Yes, food is an important consideration in gout treatment, but only as part of a proper gout management plan. Worrying about certain foods as gout triggers is pointless, and only confuses the important issues. Worst of all is the appalling lack of understanding and valid treatment programs in the health industry. But I digress – let me get back to social issues. My gout support network will push the values of openness and honest helpfulness that have brought GoutPal to the forefront of gout support. And it all comes down to you. I wrote about the importance of you in improving gout support services for everyone. To get more people involved, I have pushed forward with two of the biggest social networks. I set up a GoutPal Facebook page some time ago, but never really got round to learning how to develop it properly. I have revamped it, and I want to improve it during 2012, but I heed your help. Not only do I need you to Like my page, I also need your input about what to include on the page. At the moment, it is mainly a series of automatic posts from the GoutPal websites, but I am sure it can be a lot more than that. I do not want to detract from the gout forums on GoutPal Interactive, so I am not keen on using it for questions and answers. What would you like to see there? Google have been keen to ride on the success of Facebook, and introduced a Google Plus service, where I have recently added a GoutPal page. This service is very new to me, and I have yet to explore it’s potential. Have you used it? Like Facebook, what do you think is the best way to promote gout awareness through Google Plus pages? I have added PlusOne badges to the top and bottom of all pages here – have you shared your favorite pages with the rest of the world yet? I’m unsure how successful my network expansion plans will be, but I am certain of one worrying fact. The online world of gout continues to be manipulated by self-serving pharmaceutical companies masquerading as information sources and self-serving snake-oil salesmen masquerading as reliable product sources. They have taken over Facebook, and I see that Google Plus will be the next target. With your help, we can stop this abuse of social networks by sharing the good stuff. If you have ideas or questions about expanding the gout support network, please share them in the GoutPal Forum.